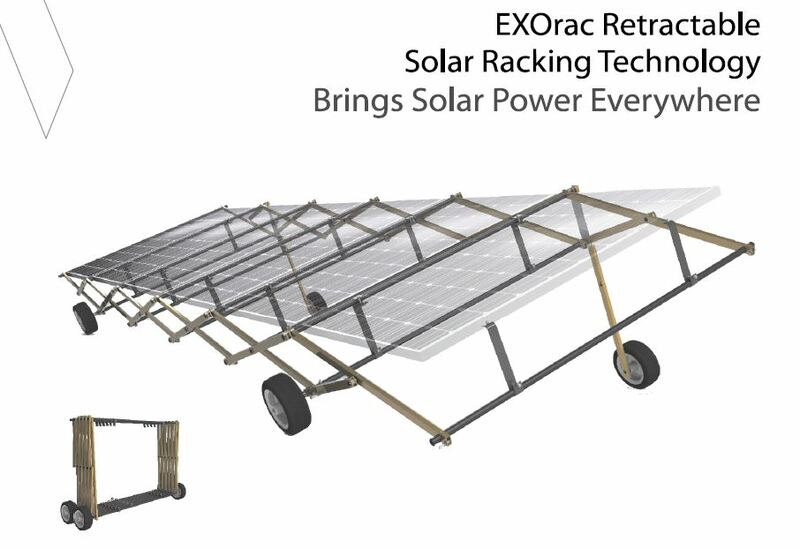 EXOrac is a Swiss-engineered, high quality, retractable solar racking system. It is a powerful solution for permanent or temporary solar PV applications because it is transportable, scalable, and plug & play. 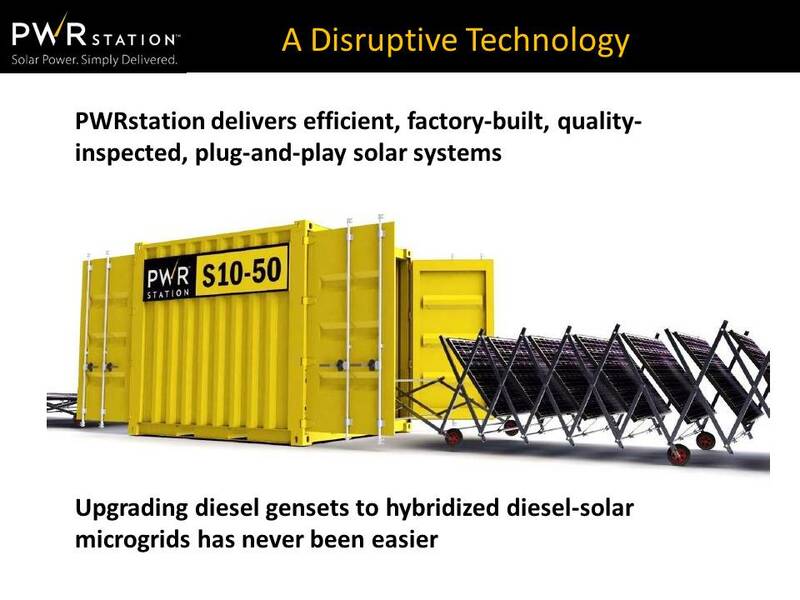 The EXOrac enables the rapid deployment and activation of a solar PV system or a hybrid microgrid. The installation process at site is simple and fast, and requires only limited technical support. 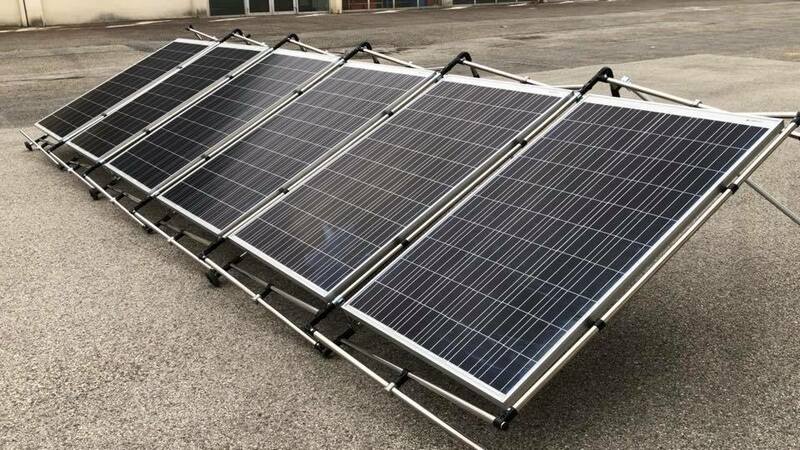 EXOrac is an ideal technology for the provision of renewable power in emergency or temporary situations, or indeed at any location where a solar system could be redeployed during its operational life. Because the EXOrac is a retractable racking system, the panels can be retracted and stored at any time either for redeployment or as a temporary measure in the event of, for example, severe weather or security risks. Each EXOrac unit carries six solar panels, and the units are then linked together to make up arrays of whatever length or layout is required. Systems can be delivered to site in containers with all panels, cables, inverters, etc fitted. The EXOracs are then unfolded from their container and positioned on site. 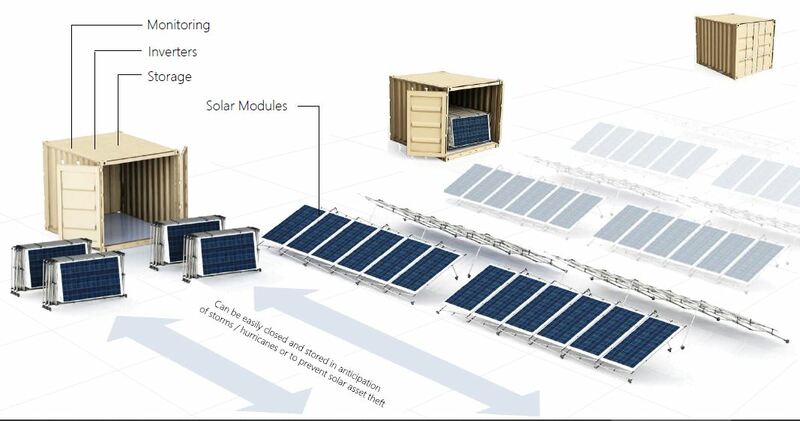 Pre-assembled in groups of 6 frames, up to 42 solar modules can be integrated in a 10’ container, up to 90 modules in a 20’ container and up to 192 modules in a 40’ container. EXOrac can be delivered to System Integrators as a partly assembled kit. System Integrators can then use EXOrac in their own products with any type of batteries, inverters, microgrid controllers or specialised equipment such as water pumps, coolers, or telecommunications equipment. EXOrac’s robust open architecture can accommodate almost any standard world-class photovoltaic panels, inverters and wiring to match local content preferences and regulatory requirements. EXOrac allows enables solar PV systems or microgrids to be fully assembled and tested in the factory, and then delivered to site ready for operation. The whole system can be delivered in containers ready to go. The EXOracs, with panels and cabling installed, simply need to be rolled into position and, after mandatory safety checks and startup procedures, the system will be operational. Blackstump Technologies markets PWRstation's EXOrac for rapid redeployment of power to remote locations and to support their range of off-grid refrigeration products including coolers, freezers and water purification. 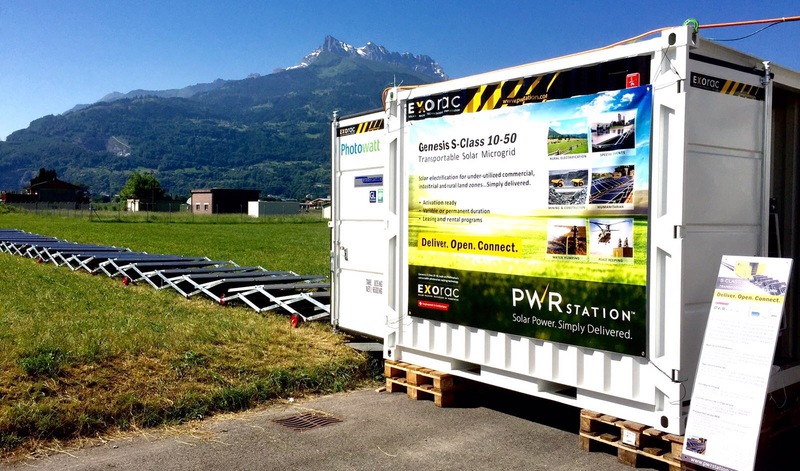 Schneider Electric uses PWRstation's EXOrac in their containerized portable solar-battery hybrid systems marketed for emergency response. In 2016 an earlier version of the EXOrac was installed at the UNHCR Refugee Camp in Shimelba, Ethiopia. Installation is simple, safe and rapid, and the panels can be folded back and returned to their containers in the event of extreme weather or other short-term risks or for relocation to a new location. For further information on individual products, or for the design of an efficient and cost-effective power system for any challenging location, please contact ZNE on +61 447344373, or press "Contact Us" for a rapid response to your enquiry.